Home → Chemicals → Hillyard, Robusto, Multi purpose cleaner, HIL0013206, 4 gallons per case, sold as 1 gallon. Hillyard, Robusto, Multi purpose cleaner, HIL0013206, 4 gallons per case, sold as 1 gallon. 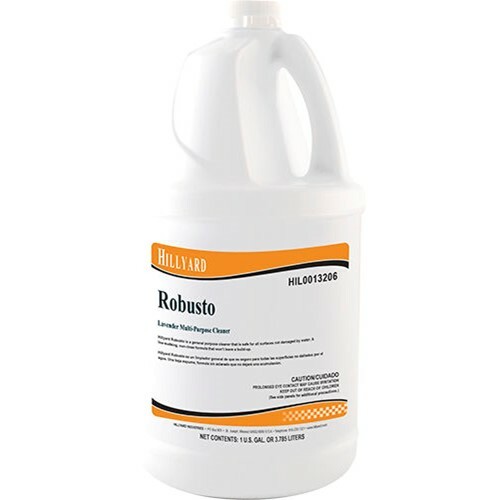 Use Robusto, a neutral pH multi-purpose cleaner to clean floors, walls, and any surface not harmed by water. It leaves a clean, streak-free finish. Robusto's fresh, clean scent of lavender makes cleaning a joy and leaves a long-lasting, enjoyable fragrance for building occupants and visitors. We use this to clean all of the school desks everyday. I really like it because it easily cleans off almost everything. 1 gallon lasts a long time because you don' have to use very much when you mix it. I use this product to clean all of my houses. My customers love the clean lavender smell when they come home!